Provide comfort for the family of Larry Thompson with a meaningful gesture of sympathy. Larry Thomas Thompson was born December 22,1946 to Thomas and Virginia (Boucher) Thompson at Webster City, IA. Larry passed away Friday February 8, 2019 at Avera McKennan Hospital in Sioux Falls,SD at the age of 72. Larry attended Webster City Schools until he entered the service at the age of 17. It was there that Larry obtained his high school diploma. Larry was enlisted with the US Marine Corps April of 1964-April of 1968. Larry at that time served a tour in Vietnam. Larry was honorably discharged as Corporal E-4. Larry’s specialty was combat engineer and powder monkey. 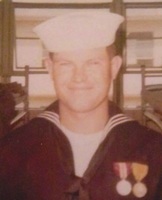 Larry then re-entered the service June of 1968-April of 1970 in the US Navy. Larry then served another tour in Vietnam. Larry was honorably discharged as BUCN E-3 from US Navy. Larry was united in Marriage to Karen Jean Thompson (Hersbergen) on November 15, 1969 in Fort Dodge,IA. Larry and Karen made there final home in Algona, IA were Larry was employed by Universal Manufacturing for over 30 years. Larry and Karen had one daughter Karrie Priscila born December 1, 1978 in Algona, IA. Larry and Karen then moved to Ringsted to be closer to their daughter and grandkids. Larry enjoyed reading, fishing, and spending time with his grandkids and great grandkids. Larry was a very social person who could talk to anyone about anything. Larry was very open about his time in Vietnam and had many slides and pictures that he would show anyone. Larry participated in the Bushy Creek Area Honor Flight on September 17, 2016 which he was very proud of. Larry also received a Quilt of Valor in June of 2018. Larry cherished that quilt and was always showing everyone what he received. Larry is Survived by his wife Karen Thompson, daughter Karrie (Robert) Hammond, Brother Jerry (Maretta) Thompson, Sister Sara (John) Durant, and sister Sharon (Arvin) Burkhart. 4 grand children and 6 great grandchildren. Larry is preceded in death by his parents Virginia and Thomas and brother Wahlee Brown. I worked with Larry for many years. A very kind, thoughtful, and personalble gentleman. My sincere comdolences to his family. Please accept my sincere condolences for the loss of Larry. Psalms says that God is near to those brokenhearted. Draw close to God and he will grant you peace & comfort during this grievous time.